People say that time is money. But the makers of this unique collection of the most expensive watches manufactured till date believe in the opposite. Here money is time. de Grisogono – Meccanico dG S25D This super cool and expensive watch is designed by de Grisogono, founded in Geneva in 1993. This Meccanico dG, costs $590,000. It has 20 units. It was designed in three variants: with baguette diamonds, with black pavé diamonds and with white pavé diamonds. It is made of 18 carats of gold, and has 126 baguette-cut white diamonds. It displays two time zones and has analog and digital displays. It has a power reserve indicator. Vacheron Constantin Malte Tourbillon Regulator The amazing watch from Vacheron Constantin’s High Jewelry collection, the Malte Tourbillion Regulator has 263 baguette-cut diamonds in the dial. The case has 274 baguette-cut diamonds. It has an elegant black leather strap. The company was founded in 1755, standing as one of the world’s oldest watchmakers. Today it is part of the Richemont Group. Omega – Constellation Baguette This watch, priced at $708742, is available in Geneva at Omega boutique. It has 30 carats, 459 Wesselton diamonds. There are 146 baguette and trapeze diamonds on the dial. The case made of 18 carat white gold case is completely covered with diamonds. Omega is owned by Swatch Group. Breguet – Classique 5349 Grande Complication This piece has a platinum case decorated with baguette-cut diamonds. It contains more than 570 parts. Three patents protect its “superior precision and technological mastery,” according to Breguet. The company today is owned by Swatch. Audemars Piguet – Jules Audemars Grande Complication The watch from Audemars Piguet has a titanium case and features a perpetual calendar indicating the hours, minutes, day, date, week, moon phases, month, and leap years. It has a chronograph and a minute repeater. The strap is made from crocodile skin. The Jules Audemars Grande Complication is available exclusively at the watchmaker’s New York City boutique. 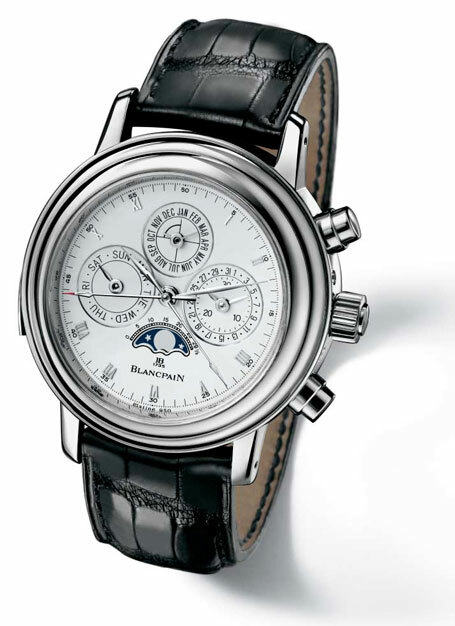 Blancpain 1735, Grande Complication The cool watch from Blancpain, has a case made of platinum. The strap is made from crocodile skin. It has a complicated machinery and has 740 handmade components and pieces. Jacob & Co. Crystal Tourbillon This elegant watch is from The Jacob & Co.’s limited Crystal Tourbillon edition. It’s case is made in 18 carat white gold and is decorated with diamonds. It has an 2.22 carat baguette diamond buckle. Initially only 18 pieces were made, available in New York only. Hublot Black Caviar Bang Source The watch has a white gold case (18 carats). It sparkles with beautifully cut black or white 34.5 carat diamonds. The case and the bezel have 322 and 179 diamonds respectively. There are 30 on the clasp too. The one million dollar watch has only one visible feature, which is the black and deep tones of the diamonds.The watch’s limited edition had only one piece. Great collection .. btw em stunned to see no Rolex ! yeah no Rolex i wonder how.